There’s a lot that goes on in a typical day at Regent. There are classes, meetings, events, but it’s always nice to end where we are called to begin each day: in God’s Word. The Fellowship for Christian Athletes (FCA) is doing just that. 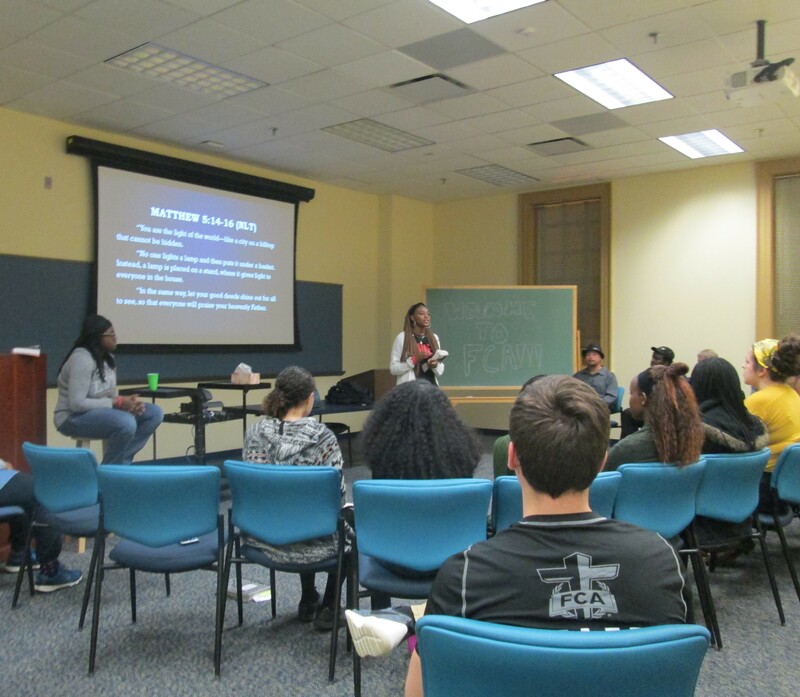 Monday nights at 8:15 p.m., RH 113 gets transformed from a typical classroom to an inviting space for athletes and non-athletes alike to gather and grow together in their spiritual walk with the Lord. Each huddle consists of a brief meet and greet with other members, a game or two to break the ice, a brief message from the night’s speaker based out of the ONE Athlete’s Bible, and then concludes in prayer and reflection, sometimes accompanied by a short worship time. The motto for the ONE Athlete’s Bible is “One Passion, One Pain, One Power, One Purpose” and centers around Philippians 1:27 which states, “Above all, you must live as citizens of heaven, condctcing yourselves in a manner worthy of the Good News about Christ. Then, whether I come and see you again or only hear about you, I will know that you are standing together with one spirit and one purpose, fighting together for the faith, which is the Good News” (NLT; emphasis added). At the end of our interview, Precious Jackson, Caleb Hebb, and Chenelle Foster wanted to thank all of the coaches who had spoken at previous huddles and for all they have done to help encourage an atmosphere of spiritual growth. If the testimonies from these three dedicated leaders are not enough to convince you to give FCA a try, I will speak from personal experience. I have attended several FCA huddles since their start and each time they never cease to amaze me in the powerful messages that are discussed and deepened. These three leaders, among the rest of the leaders whom I did not get a chance to interview, have succeeded in creating an environment for students to break out of their comfort zones, and, as Precious Jackson stated at the huddle on Apr. 9, “be bold for God.” I strongly encourage everyone to give FCA a chance. So if you find yourself with nothing to do Monday night, why not stop by Robertson Hall 113? If you drop by, you will be met with students who all want to grow together to deepen their relationship with God, and we should all embrace that. Hannah Vermont is a staff writer for The Daily Runner.